Sunday the 14th of July was a busy day for a few of us. The day started at 7.30am to cheer the British 10k runners, then we grabbed a burger (and shake. and fries. and ice-cream) from Shake Shack in Covent Garden and finally made it to our race, the Color Run in Wembley around 4pm, just in time for the last wave of Color Runners to set off. At first I thought 'why Wembley?' How the hell are they going to organize this run. Are we going to run around the stadium? The race itself was actually around the industrial area surrounding it - not the most scenic route, but who cares when POWDER PAINT is involved at every kilometer! 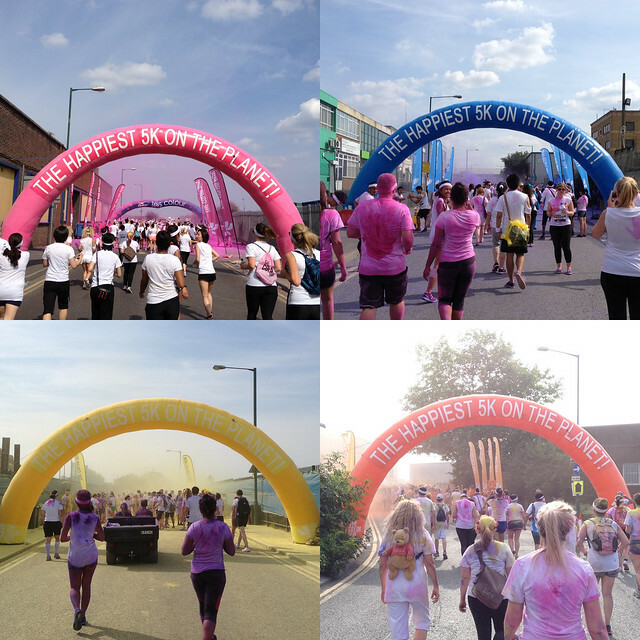 But, the main question is what is the Color Run? In case you didn't know, the Color Run is known as the happiest 5k on the Planet. It's an un-timed race - so basically we took our time (after a burger and cheesy chips we would take it easy anyway lol) and left our sport watches at home. 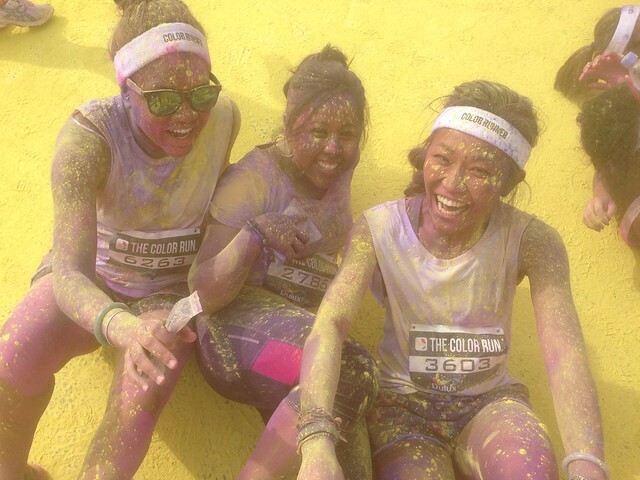 It's a lovely day out with friends and family where everyone become a Color Runner for a few hours. You don't need to be fit to actually participate. It's open to everyone. You can run it, jog it or walk it. Being fast will bore you (and leave you as clean as when you started, BORING). You can take your time and take in all the colors. We enjoyed the heat and the sunshine. Every Kilometer you enter a colour station where you will get showered with colored powder. 1km = Pink, 2km = Blue, 3km = Yellow, 4km = Orange. With the girls, we a had color fight at every stations, rolled on the floor, got kids to follow our silliness and had a laugh with everyone! As we passed the finish line an outdoor rave welcomes you with music on full blast! It was nice to see the crowd being so happy. We were all dancing, taking (a lot) pictures, jumping around, throwing colored powder. It was like celebrating Holi (festival of colors in India). It's a fun day so don't take it too seriously. Remember the times when you were a kid and your parents didn't allow you to get too messy when you were playing with colors? Well this is the time to become a child again, be stupid and messy without getting told off! A little bird told me that the dude who finished the race first asked for his time at the end. Are you dumb? LOL, go home son and read what this race is about please. If you are that serious about your running, don't bother with the Color Run, you won't like it. You'll probably get frustrated seeing people walking and not running for a PB and you know, generally having fun - your loss, and you clearly didn't get the memo. 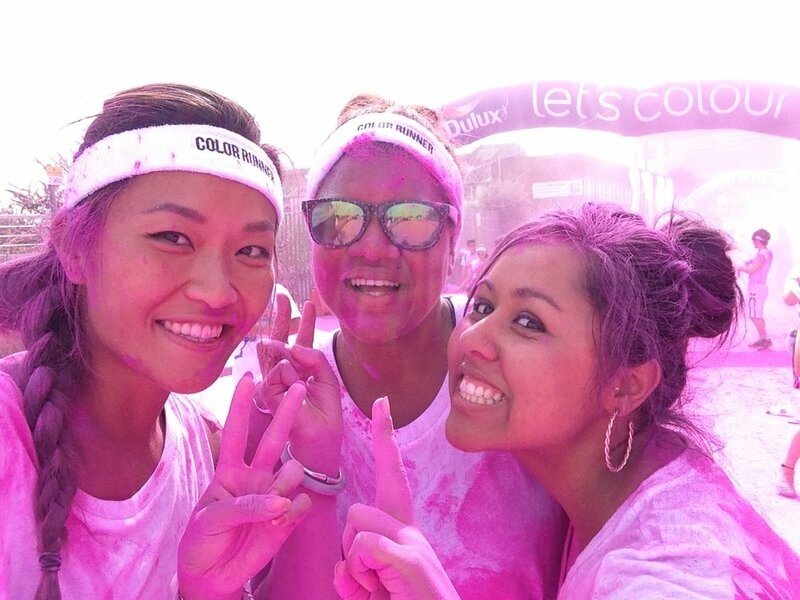 The Color run is not a PB race. It's a fun and easy race open to EVERYONE, at every level. #teamPB this is not for you! I know it's called a 'run' but this is not a competition and there's nothing to win at the end. NO MEDALS. But, who cares? It's pure fun! 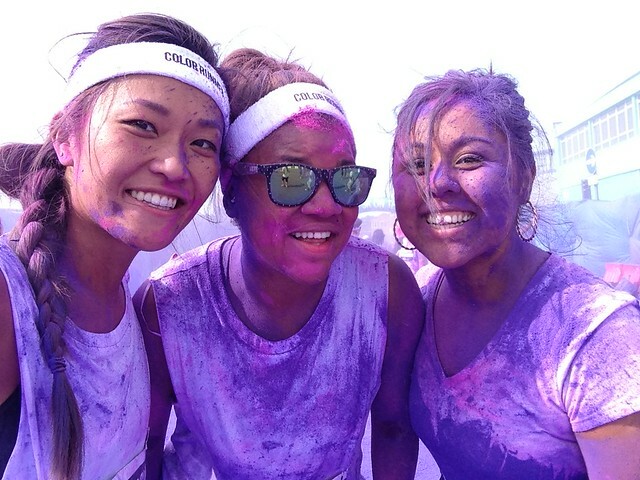 To give you a better idea of what The Color Run is about, you can watch this video. 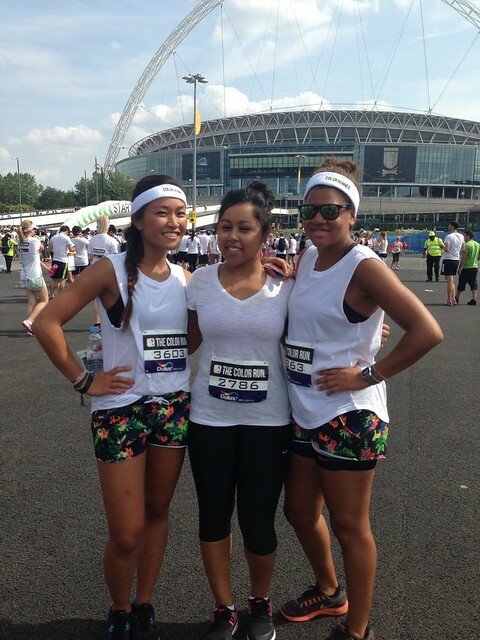 P.P.S: Big up to everyone who both ran the BRITISH 10k and ran/walked the Color Run.